Any sign at a golf tournament may provide a sponsorship opportunity. Golf tournaments often provide good opportunities for sponsors eager to put their names in front of an audience whose members tend to earn above-average income. Local companies may generate goodwill by sponsoring a charitable event, while major corporations can gain television exposure via sponsorship of a professional tournament. Whatever their budgets, businesses can gain attention at large and small golf tournaments in numerous ways. Sponsoring a golf tournament will put your company’s name everywhere, particularly if the deal includes making your business name part of the event’s title. Your company’s name and/or logo will appear on programs, banners and signs and will be mentioned repeatedly by tournament officials and, you hope, members of the media who cover the event. Tournament sponsorship on any level is not likely to be cheap. At the top level, it will cost at least $7 million to sponsor a PGA Tour event. If your company can’t afford to sponsor an entire tournament, you may wish to sponsor a hole. Your company’s name or logo will appear on one or more signs at the designated hole. Your firm may also be mentioned in the event’s program or on banners that recognize the tournament’s primary sponsors. Other partial sponsorship opportunities include a concession stand, where all the event’s hungry and thirsty fans will see your company’s name every time they purchase food or drinks. Your company can sponsor a contest that’s either held in conjunction with or during the main tournament. This may include awards for a hole in one, a putting contest, the tournament’s longest drive, the straightest drive or the tee shot that lands closest to the pin. The tournament will post signs -- perhaps on each hole -- announcing the contest, with your company’s name and/or logo on each sign. The biggest names on the PGA Tour receive millions of dollars each year to wear company names or logos on their clothes or golf bag, or to use a manufacturer’s equipment. For a single pro tournament, however, your company might find players willing to add your company logo to their shirt, hat or golf bag for that week’s play. For a smaller local event your company might provide hats or shirts to a player or players who don’t have full-time sponsors. Tournaments will place throughout the course a variety of banners or signs that may include the names or logos of sponsors. Primary sponsors typically appear on a large welcoming banner near the course entrance. Banners may also appear at the clubhouse entrance, near the first tee, and at the post-tournament awards ceremony. 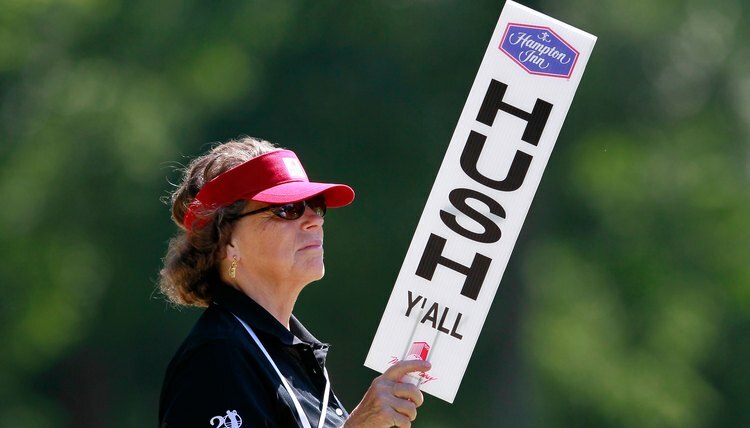 Smaller signs may include contest announcements, directional signage or signs reminding fans to remain quiet during play.